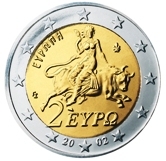 Greece was the first extension to the Eurozone (2001) and started issuing coins in 2002. Some basic facts relating to Greece. 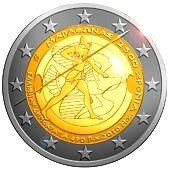 The Commemorative Coins of Greece provide a window into ancient and modern Greek history. Greek Euro Coins are one of the few sets that have eight different motifs - one for each of the coins and like Austria it has grouped them into three different themes. 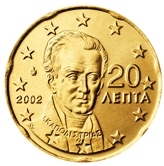 Greece started minting coins in 2002. 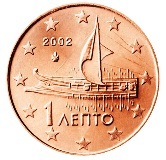 The first series of three (1,2 and 5cent coins)represent ships that have helped shape the history of Greece. an Athenian trieme (a type of warship) from around the fifth century BC. a corvette from the early nineteenth century. 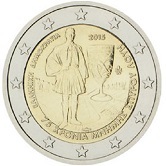 The second series of three (10,20 and 50 cent coins) reprsent famous Greeks. Rigas Velestinlis-Fereos a Greek poet and leading figure of the Greek enlightenment. Capodistrias - the first president of Greece (1830-1831). Venizelos - social reformer and diplomat. 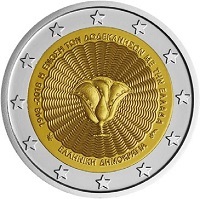 The third series of two (1and 2 Euro coins) represent figures from mythology. an owl as depicted on the Athenian drachme coin ca. 500 BC. scene on a mosaic from Sparta . 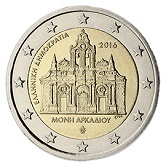 There are a few other interesting features with Greek Euro Coins. 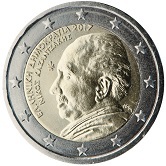 i) as Greek uses a different script from the rest of the Euro countries the words Euro and Lepta (cent ) appear on the national side of the coin. On the common side Euro and Cent appear in the normal Latin script. Although some other countries such as Austria also show values on the national side this is against the latest guidelines which only sanction the procedure for countries not using the Latin script. 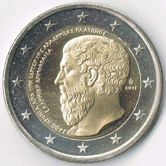 ii) in 2002 Greece was not able to mint timeously the required number of coins herself and a part of the minting was done by other "Euro countries". France : 1 cent, 2 cent, 5 cent, 10 cent and 50 cent. Finnland : 1 Euro, 2 Euro. A small letter is shown within the star nearest the date 2002. 1 cent - a small F in the star at ten o'clock. 2 cent - a small F in the star at two o'clock. 5 cent - a small F in the star at two o'clock. 10 cent - a small F in the star at eight o'clock. 20 cent - a small E in the star at eight o'clock. 50 cent - a small F in the star at eight o'clock. 1 Euro - a small S in the star at six o'clock. 2 Euro - a small S in the star at six o'clock. 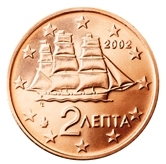 1 cent - An Athenian trieme(a type of warship) from around the fifth century BC. 2 cent - A corvette from the early nineteenth century - in service during the Greek war of independence. 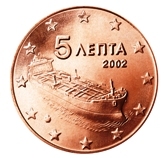 5 cent - A modern oil tanker. 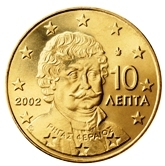 10 cent - Rigas Velestinlis-Fereos - a Greek poet and leading figure of the Greek enlightenment. 20 cent - Capodistrias - the first president of Greece(1830-1831) after the War of Independence. 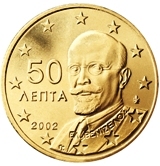 50 cent - Venizelos - social reformer and diplomat who contributed greatly to the modernisation of Greece. 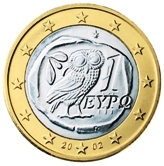 1 Euro - An owl as was depicted on the one drachme coin in Athens ca. 500 BC. 2 Euro - Scene on a mosaic in Sparta - Europe abducted by Zeus in the form of a bull. 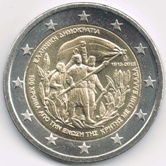 Around the rim of the Two Euro Coin appears "Greek Democracy" - in the Greek alphabet - plus one star. 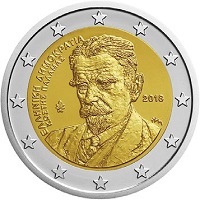 Greek Commemorative Two Euro Coins. 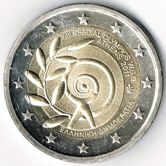 The Olympic Games in 2004 in Athens in a sense gave birth to the Euro commemorative issues. 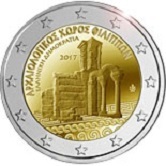 In 2004 Greece minted no standard two Euro coins for circulation but only the 2004 commemorative - indeed over 34 million of them. 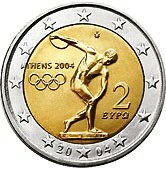 2004 - Myron Discus Thrower - Emblem of the 2004 Olympics held in Athens. 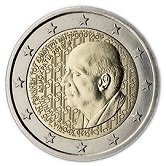 This was the very first Euro commemorative issue. 2010 - This commemorates the famous battle of Marathon that took place over 2500 years ago. Depicted is one of the Marathon warriors. 2011 - The special olympics of 2011 in Athens. These games were for retarded and severely handicapped people. 2013 - 2.400th Anniversary of the founding of the Platon Academy. 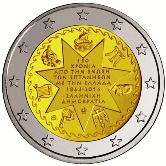 2013 - 100th Anniversary of the union of Crete with Greece. 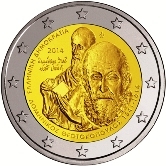 2014 - 400th Anniversary of the death of Domínikos Theotokópoulos. 2014 - 150th Anniversary of the union of the Ionian Islands with Greece. 2016 - 150th Anniversary of destruction of the Arkadu Monastery. 2016 - 120th Anniversary of the birth of Dimitri Mitropoulos. 2018 - 75th Anniversary of the death of Kostis Palamas. Return from Greek Euro Coins to Links to Specific Countries. Return from Greek Euro Coins to euro coin collector.